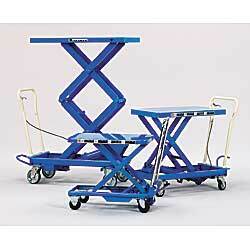 Designed to easily lift, position, and transport heavy loads in the office, factory, or warehouse. Manually operated foot pedal and hydraulic cylinder raises truck bed to desired height. Two swivel, 2 rigid casters roll truck to job site while the standard wheel brake locks truck in position during operation. Lowering controls meet ANSI safety standards. SELECTED MODELS IN STOCK. Others FOB CALIFORNIA. XB-1045 17.7 x 27.6"	 110	 330	 8.4"28.8"	 8.428.8"	 33.6" x 17.7" x 31.3"	 17.7 x 33.6"
XB-1046 19.7 x 32.1"	 190	 550	 11.3"34.1"	 11.334.1"	 39.7" x 19.7" x 35.3"	 19.7 x 39.7"
XB-1047 20.5 x 39.8"	 350	 660	 17.1"62.1"	 17.162.1"	 49.5" x 20.5" x 37.8"	 20.5 x 49.5"
XB-1048 20.5 x 39.8"	 300	 1,100	 17.2"39.3"	 17.239.3"	 46.9" x 20.5" x 37.8"	 20.5 x 46.9"
XB-1049 20.5 x 39.8"	 300	 1,760	 17.2"39.3"	 17.239.3"	 49.5" x 20.5" x 37.8"	 20.5 x 49.5"